Dusk in Santorini is a marvelous time. 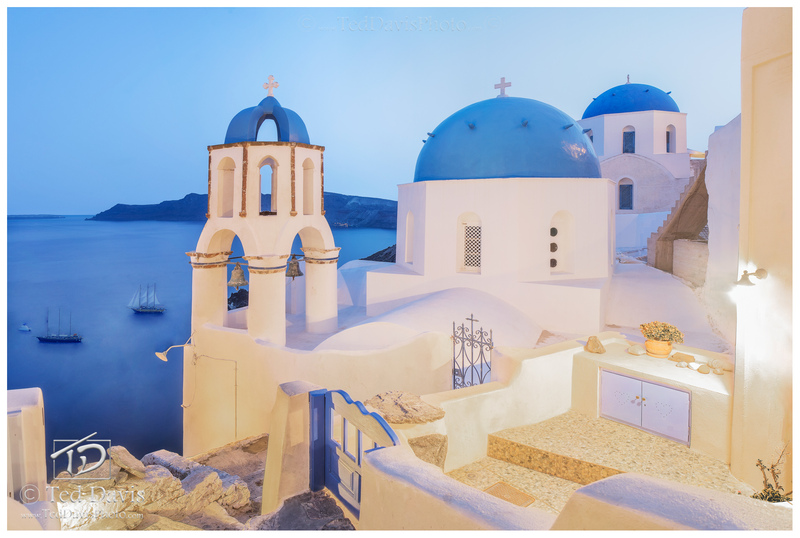 The beautiful white-washed churches and homes of Santorini are positively aglow with radiant light and the last rays as the sun seas over the Mediterranean. On this evening, I found a perfectly cloudless sky above the deep blue waters of the Caldera. I had been to this spot before, enjoyed it with friends and strangers alike, and now I was waiting for that perfect moment. As the light continued to fade, I waited patiently for the tall massed ships to pass below on the way back to port after watching the sunset. As they moved into view, I framed my shot to capture the three beautiful white towers, fabulous blue roofs, and the whimsical caldera below. Photo © copyright by Ted Davis.